Patrick Carroll died on 10 March 1899 in the Geelong Hospital. He is buried in the Geelong Eastern Cemetery. When gold was discovered the Carroll family were living in a slab house in Corio Street. Patrick Carroll, with his family and horse and dray travelled to Ballarat, the journey taking a couple of days. When the Bendigo Rush broke out, Carroll returned to Geelong with his family, and leaving them in Geelong proceeded to Bendigo to try his luck at gold mining. By 1852 there were six children in the family and after some success mining he started a carrying business between Geelong and Ballarat. In 1853, Margaret passed away and was buried at Geelong Eastern Cemetery on 28 February 1853. Patrick married to Catherine Mullins, nee Connor, on 27 January 1854. She was a widow with three children. They later had three more sons. By 1854 Carroll had three two-horse drays and was helped in the carting business by his sons, John and Michael. Born in Geelong on 17 April 1842 I have now plassed my long journey having passed the 81st milestone in my long journey through life and as I can't expect to reach many more mileposts I now make this solemn statement and it may not be long befoe I will have to make my maker to give an account of doings in this would and I now say it was my father Patrick Carroll who took all the risk in Lalors escape I his son was the one who drove the dray In which he rode and after three days and nights we arrived safely in Geelong. 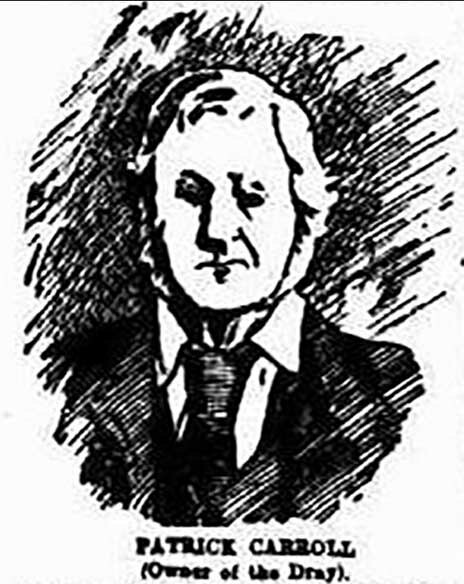 Around the time of Eureka, Carroll was camped at Yuille’s Swamp and it was in February 1855 that Carroll took the wounded Lalor to Geelong in his waggon. This was in the company of Tommy Marks and Carroll's son Michael. ↑ Kranjc, Elaine & Phelan, Lorraine, The Geelong Irish: A record of some 19th Century Families. ↑ Transcription of a hand written document in the collection of the Gold Museum. This page was last edited on 21 June 2018, at 12:45.